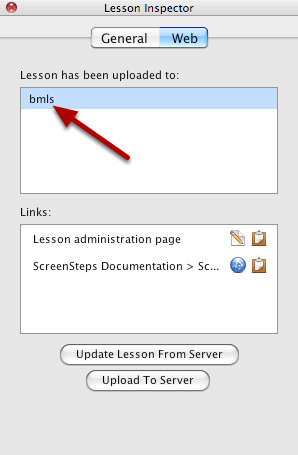 As of version 2.8.7 you can break the link between a lesson and a web server. This allows you to upload the lesson to the web server as a new document rather than updating the existing document. If you need to break the link between a lesson and a web server then select the server and press the Delete or Backspace key. You will be shown a dialog asking you whether or not you want to break the link. Click the Break Link button to break the link. The next time you export the lesson to the server a new lesson will be created rather than the existing lesson being updated. Prev: How Can I See Which Web Servers I've Uploaded a Lesson To?